All four games in the first round of the 24th Meijin league have now been played. Previously we gave the results of the first three. The fourth game continued the pattern already seen of former Meijins losing. 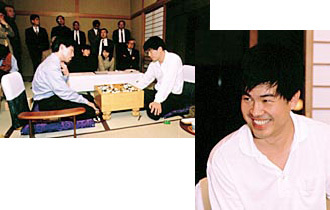 This time it was Kobayashi Koichi, who won seven Meijin titles in a row and who was fresh from winning the 1998 Tengen title, who lost. 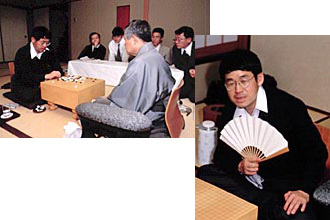 His victorious opponent was his disciple Sakai Maki 6-dan, who, aged 30, was playing in his first league. Holding black, Sakai won by 4 1/2 points, thus making a very auspicious debut. He joins Yoda, Mimura and Ryu in the early lead. The fifth and final game of the 24th Tengen title match was played at the Tokushima Park Hotel in Tokushima City on December 17. The match was tied two-all between Kudo Norio Tengen and Kobayashi Koichi 9-dan, thus setting up an exciting climax. Playing white, Kobayashi won by 11 1/2 points after 266 moves. The game concluded at 7:53 pm. Of their time allowances of five hours each, Kobayashi had 15 minutes left while Kudo was down to his last minute. Kobayashi previously won this title in 1985 and 1986. The fourth game of the 24th Tengen title match, in which Kobayashi Koichi 9-dan is challenging Kudo Norio, was played at the Hotel Okura Kobe in Kobe City on December 10. Playing black, Kudo won by 6 1/2 points after 265 moves, thus evening the score in the title match at 2-2 and keeping alive his chances of making his first title defence. Of their time allowances of five hours each, Kudo had ten minutes left and Kobayashi three. The match will now be decided by the final game, scheduled to be played in Tokushima City on December 17. A new international tournament is set to debut at the end of this year and it is the first to be organized by Chinese sponsors. The tournament is the Chun-lan Cup and the opening two rounds will be played in Beijing on December 26 and 28. Twenty-four players will participate - nine from China, six from Japan, five from Korea, two from Chinese Taipei, and one each from the U.S.A. and Europe. First prize is $150,000 (about ¥18 million), which is almost as much as the Fujitsu Cup. The final is a best-of-three and is scheduled for around mid-1999. The Japanese representatives are: Hikosaka Naoto Judan, Kudo Norio Tengen, O Rissei Oza, Yoda Norimoto Gosei, Yamada Kimio, the ex-Oza, and Yuki Satoshi from the Kansai Ki-in. Playing for the U.S.A. will be Michael Redmond and for Europe Catalin Taranu 3-dan. The first three games in the 24th Meijin league have now been played. Two former Meijins have got off to a bad start, with Kato Masao losing to Ryu Shikun and Takemiya Masaki losing to Mimura Tomoyasu 8-dan. In the other game, Yoda Norimoto Gosei defeated Kobayashi Satoru 9-dan. In the remaining first-round game, Kobayashi Koichi 9-dan will play league newcomer Sakai Maki 6-dan. This year's unsuccessful challenger, O Rissei, has a bye. The best start in the 54th Honinbo league has been made by Cho Sonjin 9-dan, who has won his first three games. He is closely followed by Ryu Shikun on 2-0. Every other player has suffered one or two losses. O Rissei has taken the 46th Oza title with three straight wins. The third game between O 9-dan and the title holder, Yamada Kimio, was held at the Tama-no-yu Inn in Yufuin, Oita Prefecture, on December 3. This was the first kadoban for Yamada, but he was unable to halt O's momentum. The game ended at 8: 41 pm after 163 moves, with O, holding black, winning by resignation. O thus won his second Oza title after a blank of two years. O had 30 minutes of his time allowance of five hours left and Yamada one minute. The third game of the 24th Tengen title match was held at the Hotel Sakura in Ureshino Hot Spring in Saga Prefecture on December 3. Playing black, the challenger, Kobayashi Koichi 9-dan, forced the title holder, Kudo Norio, to resignaiton after 215 moves. This gives Kobayashi a lead of two wins to one loss, so he needs just one more win to take his first Tengen title for 12 years. The fourth game will be played at the Hotel Okura Kobe in Kobe City on December 10.